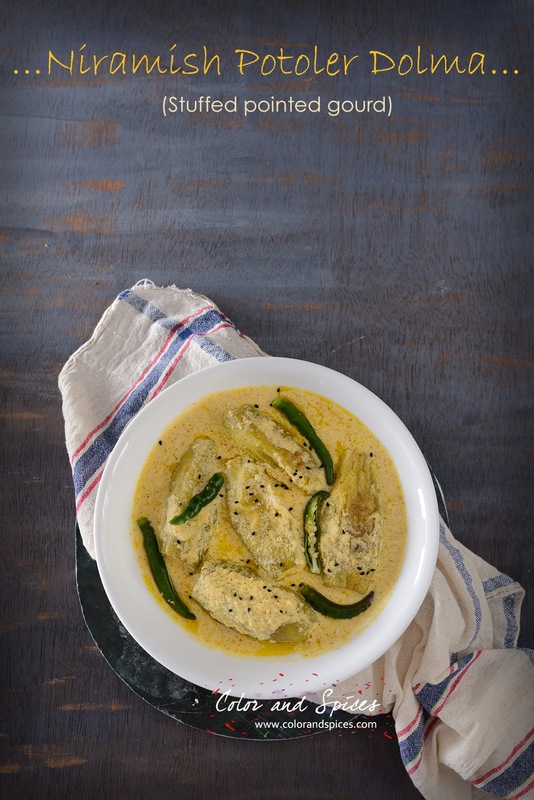 Potol or Parwal (pointed gourd) is a common summer vegetable in India. It's a love or hate vegetable. Either you like it or you don't. I fall in the first category. Whether it is fried and served with dal and rice or curried with some potato or prepared with some poppy seed paste(potol posto) I love them all. 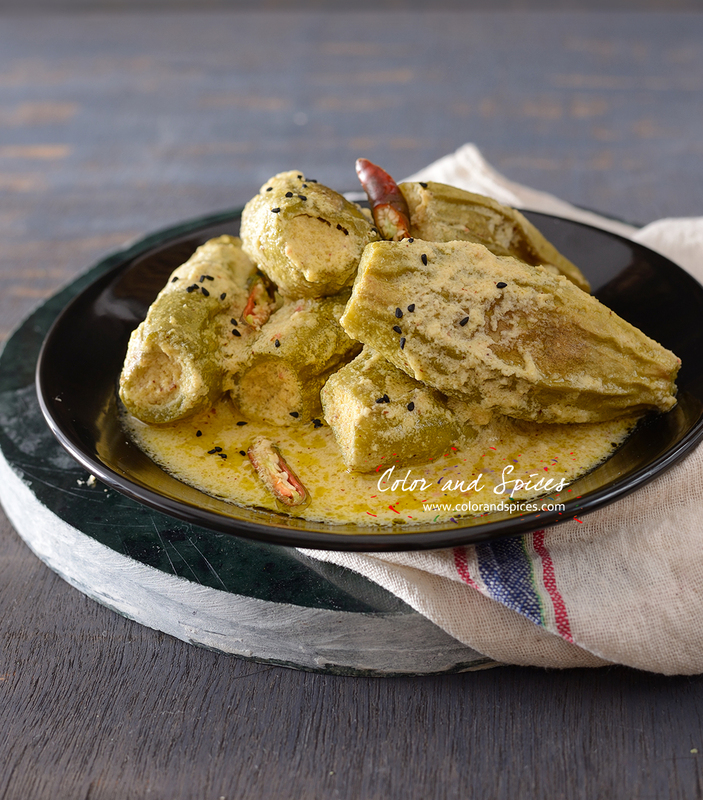 There are several other way pointed gourd is cooked in a Bengali household. One of the popular preparations is Dolma, stuffed pointed gourd with fish or minced meat. The non vegetarian version is very popular. I remember the day after my marriage ceremony I tasted some awesome fish stuffed pointed gourd, specially prepared for me and my husband. I had a concept that potoler dolma or stuffed pointed gourd can only be made with non-vegetarian stuffing. But I was wrong. The vegetarian version tastes as good as the non-vegetarian one, if not more. It was a baby shower party of my cousin, their family has a custom of preparing everything vegetarian for this occasion. There were several delicious dishes, but for me the stuffed pointed gourd was the show stopper. So this time I tried to recreate that in my kitchen. I do not know the exact recipe, I relied on my memory of what I ate that day and prepared this niramish potoler dolma. And it came out finger licking good. The dish a bit complicated and time consuming, as one need to scrape the pointed gourd, prepare the stuffing, stuff it, fry it and dunk it in the gravy. The recipe involves several steps, but the end result is so good that I'm sure you won't mind. First of all try find out some extra large pointed gourd, that will make easier to scrape the core. 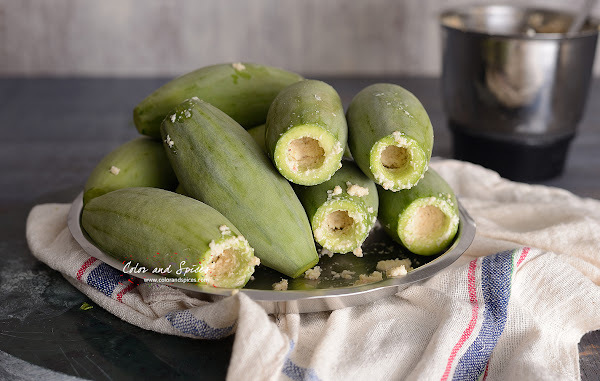 To scrape the inside of the pointed gourd cut only a small part from each ends and with the back of a spoon scrape out the soft core of the vegetable only from one side, keep the other side sealed. Do not throw away the scraping, I added it to the coconut and poppy seed stuffing I made . But if you find the seeds are too hard then discard it. As I mentioned, I made a coconut and poppy seed stuffing for this dish, I also added the scraping of the pointed gourd in my stuffing, blended well with some salt, sugar and green chilies. Make sure the stuffing is not watery. While making the paste in a food processor or grinder add as little water as possible. And also make sure not to over stuff the pointed gourds, or else the stuffing will come out while frying. 1. Wash the pointed gourd(potol) very well. Pat them dry. With the help of knife scrape the outer dark green skin. Do not peel the skin. Cut a small part from each ends. Using back of the spoon scrape out the inner soft core from one side. Keep the other side sealed. Rub little salt to the pointed gourds and keep aside. 2. In a bowl mix little water and yogurt and blend it well till smooth, keep aside. Make a paste of coconut, poppy seed, black mustard, green chilies for the gravy, keep aside. 4. Stuff the pointed gourd with the coconut stuffing. Do not over stuff. 5. 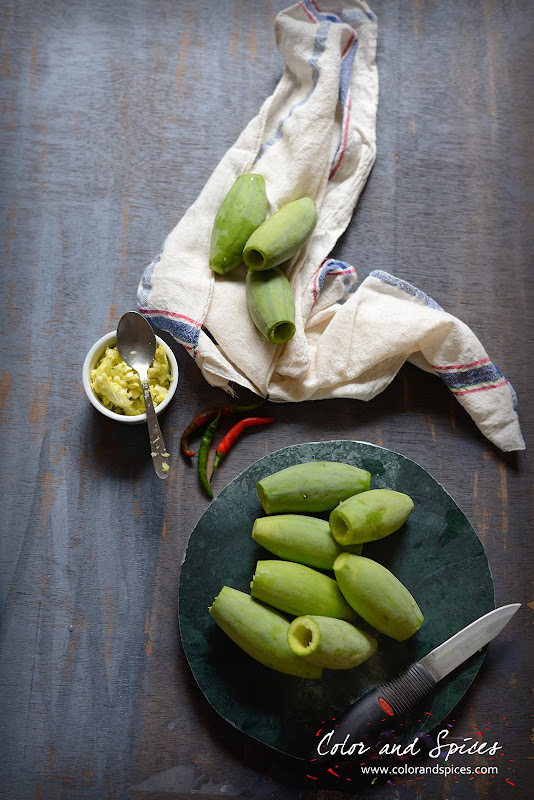 In a kadhai or deep pan heat mustard oil, fry the stuffed pointed gourd till nicely browned. Keep aside. 6. In a fresh kadhai or pan heat mustard oil, when the oil is hot add onion seeds and dry red chilies. As the seeds splutter add the yogurt, and the paste made for the gravy, cook over low heat for 5-6 min, or till oil separates. Add turmeric powder, red chili powder, salt, sugar, mix well. Add the fried stuffed pointed gourd, add little water, let it boil, cover and cook for 5-6 min. switch off the heat. Transfer it to a serving bowl. 7. Sprinkle mustard oil, garnish with slit green chilies, serve with rice.